Barefoot Angie Bee: Right on the Walls review! Right on the Walls review! I was very fortunate to have been offered to choose a design from Right on the Walls. It was incredibly difficult to choose only one! There are many categories of art to choose from. I finally chose from the miscellaneous. I was drawn to the lettering and style as well as message of this one. I am a very bad blogger for having received the art and yet it took me a long time to choose where to put it and then get it up and reviewed. I am however very pleased with the quality and ease of use. The directions are simple enough and the only issue I had was that I had to be very patient and go slowly. I wanted to stick it and get it done! I was very excited to see it finished. Here is a photo of our kitchen wall before putting up the vinyl decals. It was hard to let go of the kid's art but it needed to be taken down as it was curling and creased. We needed a change and this was just the motivations to get it done! I like the blue and black although I wish I would have chosen a more vibrant blue. I am however very pleased with the lovely high contrast between the walls and the lettering. Its so much nicer than I imagined and we did a great job putting it up! Here it is on the wall and finished. It was a great project for Jaymon and I to do together. Inevitably when we were the most focused the little ones wanted a million things! In hindsight it didn't seem to take long at all to apply it to the wall and what a huge difference it made. It makes me happy to think that I will read this message so many times each day! Now time for more plants for the winter. If I were to choose again, I would love to have one of the big trees and a wall clock. I love the fairy door as well. The vinyl decals easily come off so no pressure to have to paint over down the road. The decals can be placed on many surfaces. Right on the Walls can also customize messages. I have a very pretty decal with flowing BAB for Barefoot Angie Bee. I have yet to decide where to place that one. Check out Right on the Walls here! I definitely would recommend purchasing from them when you want to add inspiration or whimsy to your space. edited to add that this is perfect for renters since its not a permanent addition to your space!! Looks great Angie. 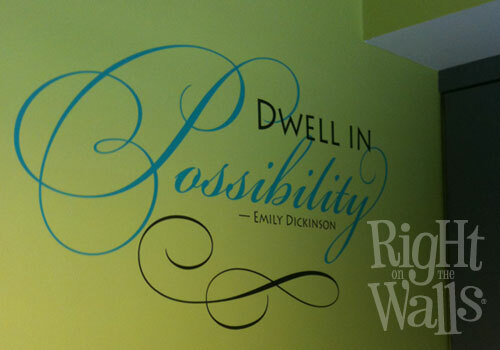 I wish I wasn't living in a rental so that I could do something as inspiring as a wall decal. nice wall art. It seems very calming. For me..our house is so small, i don't know a nook to put it. 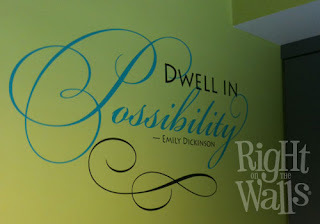 Love the wall lettering stuff. Haven't tried from this company though I'll have to check it out. Your wall looks great. That looks really beautiful! I love the idea of "righting" on the walls like that. I know what you mean about the children's art, hating to take it down. I've recently been photographing my walls with the art on it because I think it has to come down at some point. I also have been scanning stuff in and am planning to scrapbook it. It looks fantastic! Great choice. That is SO cool! It looks great! That is really cool! I love the saying, and the design. You picked the perfect one!